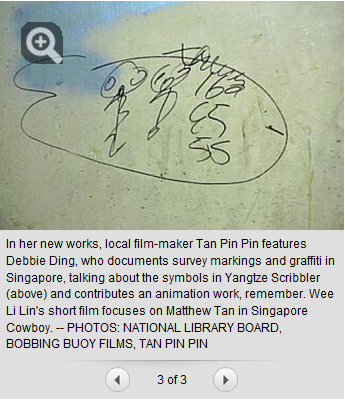 Pin Pin's Yangtze Scribbler was featured in the Straits Times today, along with Wee Li Lin's Singapore Country. 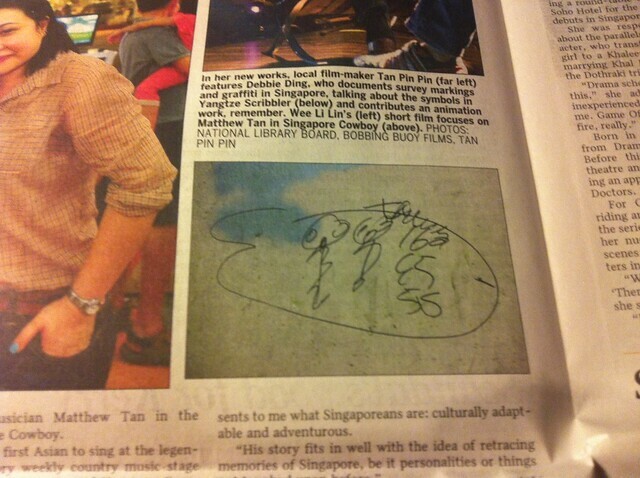 They printed a decent sized photograph of the Scribbler's mark in the Life Section. Never would I have dreamed that it would one day see the light of day like this. I wonder if someone will see it and find a way back to me and then tell me what it all means? IF SO, MR YANGTZE SCRIBBLER, WILL YOU FIND ME AND LET ME KNOW? Our paths must certainly have crossed in the past. My name is Debbie, half my hair is black and half my hair is yellow and this is the easiest way to recognise me. I am friendly and can be usually found roaming the streets around Sungei Road. I would write my phone number here but I suspect you don't use the internet. But how will I find you on the streets? Do Digital Worlds Fill up with Digital Kipple? By DBBD. Powered by Blogger.